Mighty Man bursts through a window into a restaurant, locked in combat with a super-freak called Nuke Rage. The villain claims to be fighting to make people aware that civilization began in Africa and that white society is oppressing his people. Mighty Man points out that he does not care what color his skin is but Nuke Rage is a criminal and thus needs to be taken out. He flies his opponent outside where Barbaric and Ricochet have worked together to defeat WildHair. The bouncing Ricochet seeks to help out Rapture but she had been doing fine against Rock Woman on her own. The villainess closes in on Ricochet but is shocked unconscious by Rapture which leaves just SuperPatriot who is up against a floating super-freak named H.U.B.E.R.T. 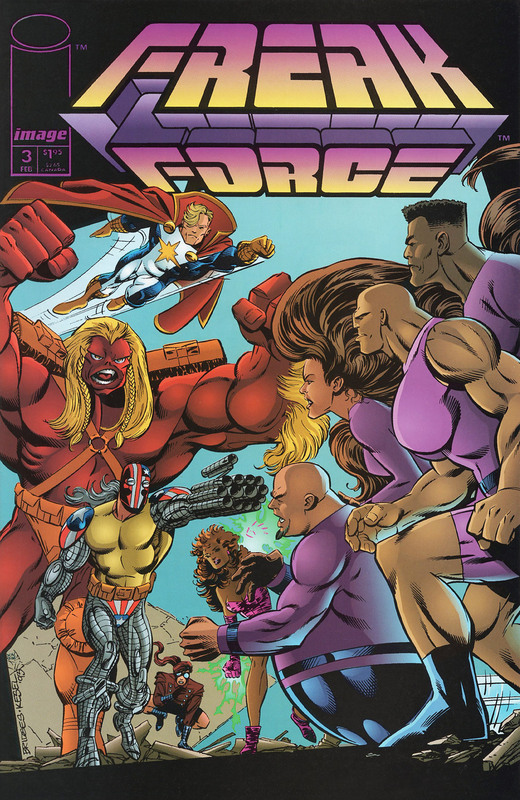 He scares the villain into surrendering with gunfire which leaves Freak Force victorious. They had been battling a super-team called the Throwaways and wonder just who had cast them aside. The Chicago Police Department round up the Throwaways and keep the general public back which includes a woman named Chelsea Nirvana. She had seemingly been taking photographs of the heroes before having her purse stolen by a mugger. He flees the scene but a bomb hidden in the bag is then detonated which kills the criminal. Chelsea then heads to a secret hideout that had belonged to her father and uploads the images that she had taken of Freak Force. This machine is actually a genetic matrix that can create clones of whoever had had their images recorded. Barbaric was in too many pictures which prevents Rapture from being copied and SuperPatriot’s clone is missing his limbs and part of his face making him useless too. Chelsea is forced to double up on Barbaric clones but their immaturity soon infuriates her. She has her Mighty Man duplicate deal with the duo but he ends up throwing them into the machinery which destroys it. Mighty Man overhears SuperPatriot berating his performance against the Throwaways to Dart and asks to speak to his teammate in privacy. Mighty Man attempts to explain that although the powered entity is the same that SuperPatriot worked alongside in the Liberty League, the host body is different. He gets too confused trying to explain their details and ends up flying away, worrying SuperPatriot that he is suffering from some kind of mental breakdown.